Stay up to date with releases and grab your FREE book! There is too much coddling today! Children who live at home well past the college years. Parents who continue to financially support their children into their 30s. Parents forgetting that it’s okay, and necessary to say NO to their children. Teachers not using red pens anymore to mark wrong answers so that students don’t feel negative about their performance! The answer is wrong, that’s a negative thing! I know a young woman who left our office for a better job, one that was in the career field she wanted. I sent her off with a great big “Good Luck” and “Congratulations!”. Two months later she quit that job because it was too stressful and difficult. She didn’t have another job lined up. She’d find something eventually. She lives with her mom- has never lived on her own. This irritates me to no end, a grown up puts up with a bad job until they get a new job…then you dump the bad one! How many people would love to have the crappy one instead of no job! — I’m digressing. It seems to me that today to many people want to be hand held and shielded from all bad things. Bad things happen. We get the answers wrong sometimes. I think most intelligent individuals can read the back of the book and get a pretty good idea as to whether or not the book is going to trigger something in them. If not the back of the book, everything is on google- look up the plot. 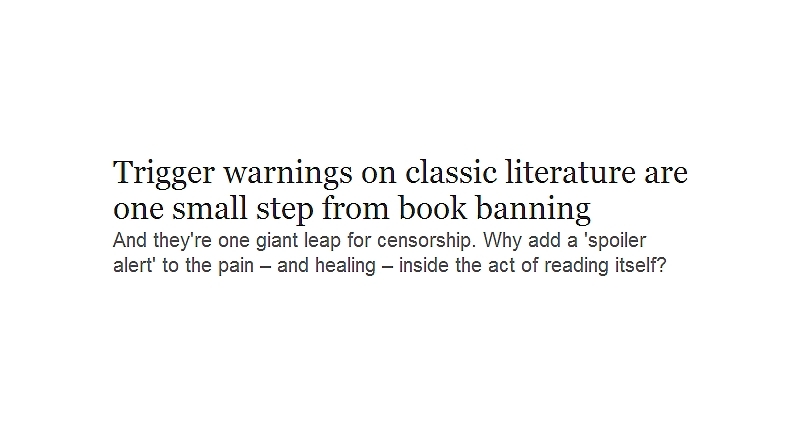 Some books might warrant a warning. Katie Porter has put warnings on the back cover of some of her books to warn the reader of a possible trigger. It was her decision, and I think the right one for the topics she wrote about, but it should be the author’s decision. No sticker placement as an industry standard. It’s time we all grew up and faced the reality of reality. The big red pen needs to be brought back out of the drawer. I wonder if those college students were just looking for a way out of having to read some really awesome classical literature? Yes to the red pen! Yes to parents saying NO again. Yes to children flying out and becoming real grown-ups! I completely agree with your post!